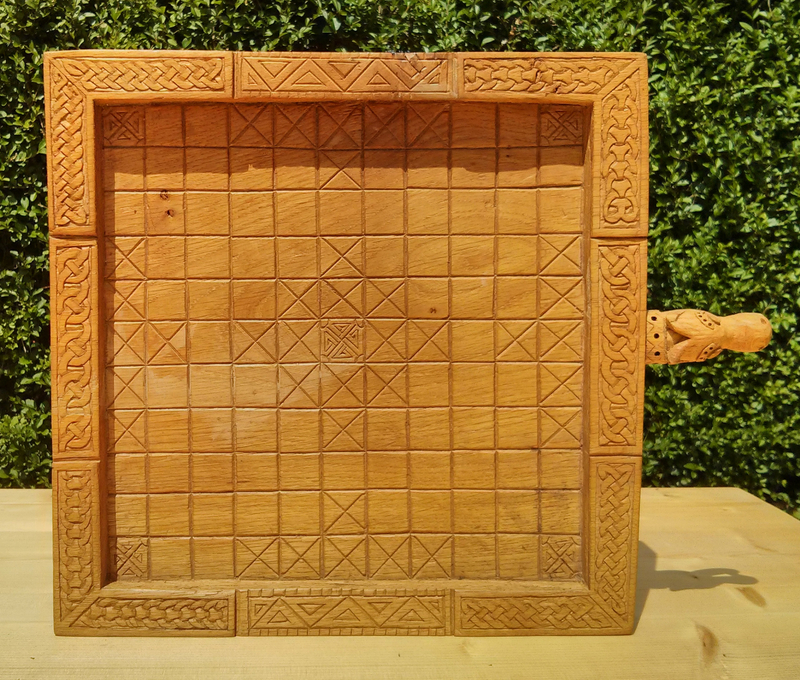 Game boards were usually carved on wooden boards, or "tables". To "play at tables" was to play board games. .
Hnefatafl is a two-player strategy game, comparable to chess except that the two players have different pieces and objectives. The game revolves around the king's attempt to escape from his besieged fortress while the attacker's tries to trap him. The attacker typically has twice as many pieces as the defender. The word "hnefi" is Icelandic for "fist" and I take it to refer to the way the king is trying to "punch" his way out of the siege. The king piece is however often referred to as "hnefi" and the game described as "king's table". 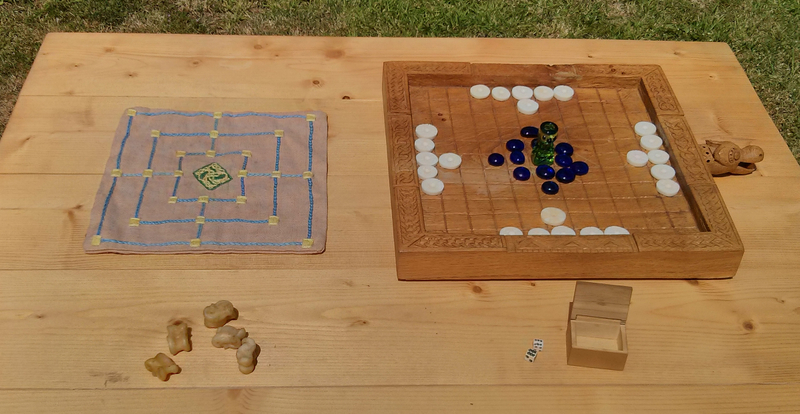 A number of wooden boards for this game have been found, of different sizes but clearly the same game because the markings on the board match the gameplay. The game was popular in many countries over a long period of time, in locations influenced by Vikings such as Scandinavia, Wales and Ireland: it is mentioned in several mediaeval sagas, and is even depicted on a Swedish runestone. We have some idea of the rules from accounts such as Carl Linneus' description of the game Tablut being played in Lapland in 1732. However no account of the rules is complete and so people have developed a variety of different versions which are balanced and playable. My board was carved by Adam Parsons. The main board is a single piece of oak, with the dragon head carved separately. The shape and decoration of the board are based on a game board from Ballinderry, Ireland. A two-sided playing board found in the Gokstad ship burial has a nine men's morris board carved on one side. Dice have been found in a number of Dark Age excavations. We don't know exactly what games were played with them but they must have involved chance, and may have involved bluffing. If you have two dice and a small box with a lid, or a flat-bottomed cup and something to cover it with, you can play this Danish game which works well with three or more players. I learned it in the 1980s from some Danish re-enactors but I don't know of any evidence for the game's origin. The name is pronounced "my-ah". People have been playing games of skill and chance with these small bones since antiquity, across the world. I recently met a Chinese gentleman who laughed and said that in his village, they played similar games using small beanbags filled with rice.I bought my knucklebones from Bikkel en Been and I believe they are from sheep.